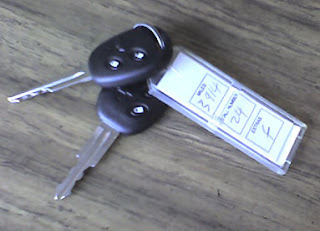 Rental Car Keys - permanent linking defeats the purpose! I'm currently on vacation, and enjoying the very best $10,000 car that Alamo has to offer. Surprisingly, it's not the car that's been on my nerves -- it's the keys. Both keys, and a fabulous fob ("fobulous?") were permanently linked with a crimped steel cable keyring. So I cut the keyring, and now carry only one key and something a little more useful. The full set will be returned on a standard keyring and hopefully passed on in that state to the next renter. And if they fine me, well... it was even kinda worth it.